The bungalow at 34 Mason Street, Reservoir, constructed c.1931 for James Paterson, a motor garage proprietor, and his wife Emmaline, is significant. It is a well-detailed single-storey brick bungalow which has three gable roofs clad in terracotta tiles. A large roof spans most of the building, with two smaller roofs covering a projecting bay at front and the front verandah. The verandah has a large brick arch with well-detailed voussoirs of brick. The front doors lead off the verandah. They are a pair of timber frame doors, each with elliptical-shaped glazing. The house's walls are red brick, with banding and other details in a deeper coloured brick. Windows are timber frame double-hung sashes. The house is in good condition and has a high degree of external integrity. The woven wire front fence fence, garden setting and the mature Canary Island Palm (Phoenix canariensis) also contribute to the significance of the place. Later alterations and/or additions are not significant. 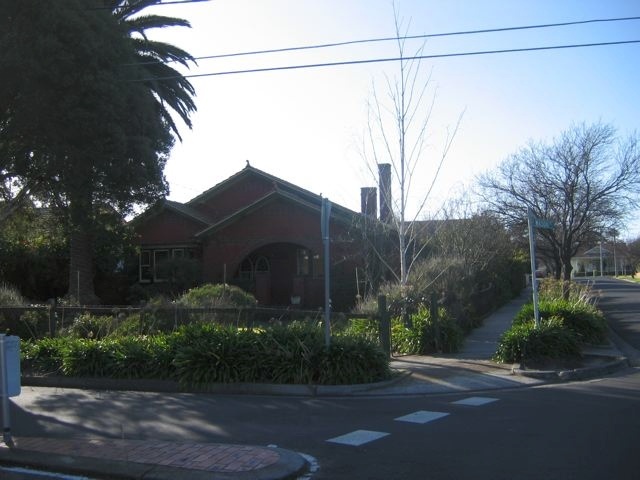 The bungalow at 34 Mason Street, Reservoir is of local historic and aesthetic significance to Darebin City. A single-storey brick bungalow on the northwest corner of Mason and Arlington Streets, Reservoir. It is set back from the street behind a mature garden, which has a mature Canary Island Palm (Phoenix canariensis). The woven wire front fence and agapanthus plantings provide an appropriate setting for the house. The house has three gable roofs clad in terracotta tiles. A large roof spans most of the building, with two smaller roofs covering a projecting bay at front and the front verandah. The verandah has a large brick arch with well-detailed voussoirs of brick. The front doors lead off the verandah. They are a pair of timber frame doors, each with elliptical-shaped glazing. The house's walls are red brick, with banding and other details in a deeper coloured brick. Windows are timber frame double-hung sashes.